This is Elke. She's a snow fairy or faery if you prefer this spelling. Even though I've got the flu I'm still struggling to do some things. I can't get out to finish shopping so I thought I'd put Elke up for sale. I've also been putting in some time working on my facebook page. Really prefer the blog but thought I'd give it a try. Still working but fighting flu! This is a pile of fabric and supplies to be put away but I wanted to show off my old tree skirt. I've added something with the year worked on it for every year I've been married. There's tatting, patchwork, felt things, embroidery, beads, crochet, and even paper crafts. The angel in the middle of the picture is a cheater. I cut her out from Christmas fabric then stitched her to felt and added the heart she holds. There are a few quicky ones when I didn't have time for much. Over the years I wished I'd made it using a solid color instead of gingham but when I got married gingham and eyelet were pretty popular. I even thought about removing everything and putting it on a new skirt but after all this time I think it would ruin the memory. Besides the tree is always done in red, white, and green and it has low branches so the skirt doesn't show much. It's more the memories I get when I get out out and put it away that make me happy! 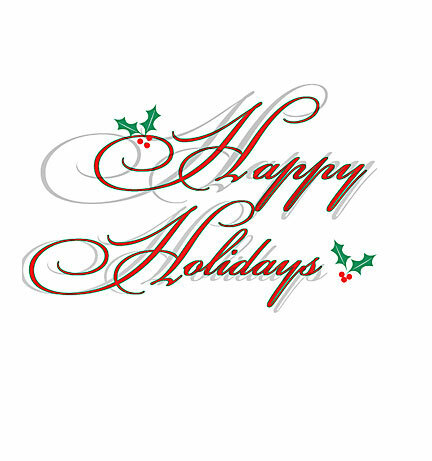 Hope you all have a Merry Christmas and Happy New Year! 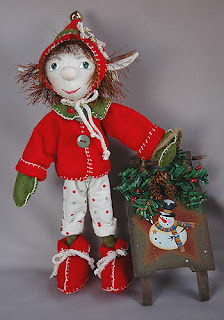 These are 2 new elves I listed on ebay. Kirby, above, has a small hard back book. It's Christmas A-Z! Dunstan, below, comes with a wood sled. They're the same as the ones I make every Christmas with the fully wired body. All the felt clothing is hand sewed! Felt Pilgrim Mouse at ebay! Is this little guy too cute?! It's another pattern from Cheswick. I'm late in finishing him but I thought I'd still list him. I love to work with felt so these patterns are perfect for me. 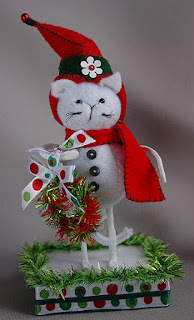 Felt Snowmen and Cat at ebay! Here's a new cat I made that's up for sale at ebay. I used a pattern I bought at etsy by Cheswick. I designed the hat and scarf and added the tail. The original pattern didn't have a tail. 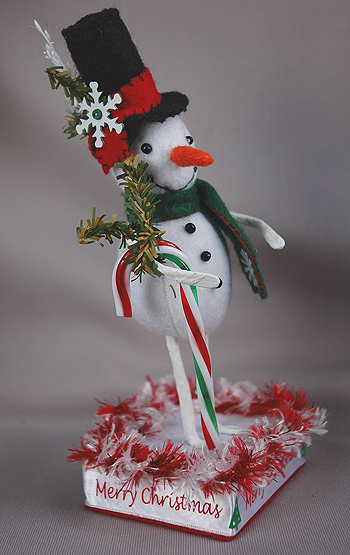 These 2 snowmen are also up at ebay. The only difference in them is the color of the scarves and the hat bands. Again I designed the hat and scarf patterns. I love these cute small felt decor dolls! 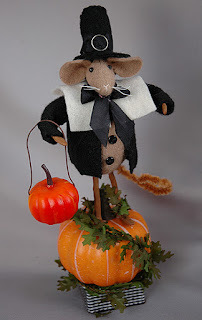 I also have a pilgrim mouse to list. Last month I made a cat and frog for Halloween, a bit late but they were also from patterns by Cheswick. Cheswick doesn't have a penguin but I used pattern parts from they're other patterns to design one. I still have to do the feet. 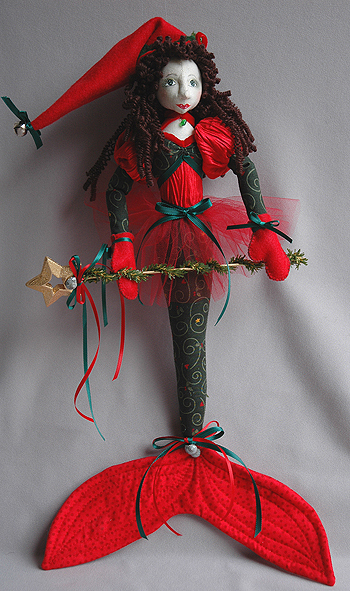 Watch for elves and Christmas fairies coming soon to my ebay listings! 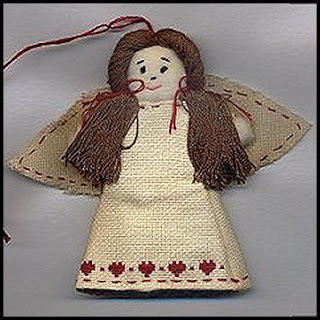 In case you've never been to my web site you can find a pattern for this easy to make angel ornie there. I made her wings and dress using cross stitch fabric but she's even cuter made from other fabrics and lace! Here are the newest mermaids I have at ebay. Just got in the mood for them after making a witch mermaid before Halloween. Right now I'm making some elves. You'll find a few up at ebay right now. I'll post pics another time. It was surprisingly easy and I put it on my ebay ME page. 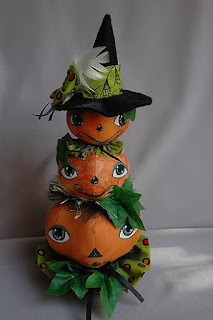 It shows dolls I just made for Halloween. Most are still available so if you see one you like contact me at ebay or etsy and I can list it for you. 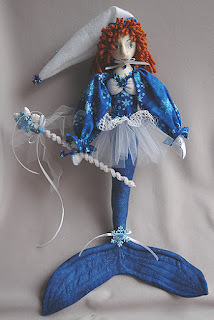 Now that I know how easy it is, I'll make one for my winter Christmas dolls, too. Angel Bear Pattern In Soft Dolls & Animals! 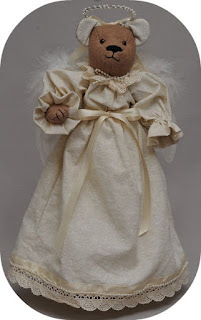 Look for the Jan. issue of Soft Dolls & Animals to get the pattern for this tree topper angel bear I designed. It may say Jan. on the cover but you should be able to get it now. 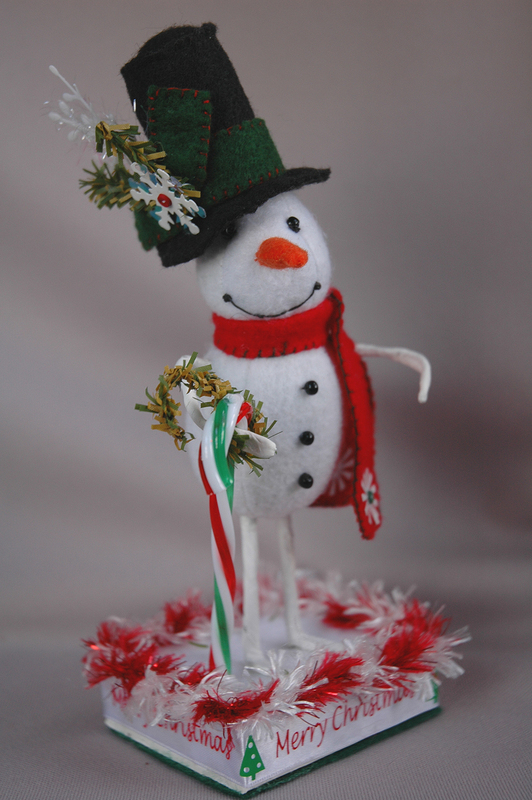 She's built on an empty thread cone like my snowmen and prim angel patterns. The felt makes sewing the bear much easier that using fur. Substitute fuzzy felt for a fur look! Took me ages to get this photo upright. Don't know why blogger insisted on putting it sideways. I had to go to picassaweb where they store all the blog photos and fix it there. New Dolls at Ebay and no sewing machine! Here's a pic of a new doll I have up at ebay. I got the pattern for him and a few others at The Cheswick Company's etsy store. Love her patterns because you use felt to make them. I also have a cat done but have to edit the pics. 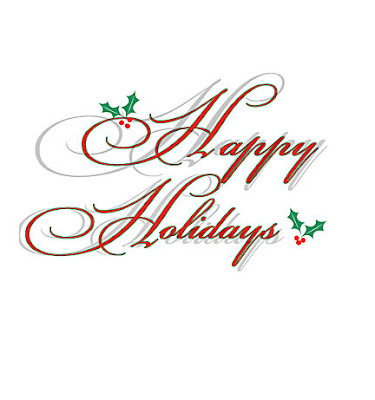 Look for a Christmas cat, a Thanksgiving mouse, and 2 snowmen. I just need to decide what kind of bases I'm putting them on. Last week was another one of those weeks where it seems every time I touch something electronic I do damage. 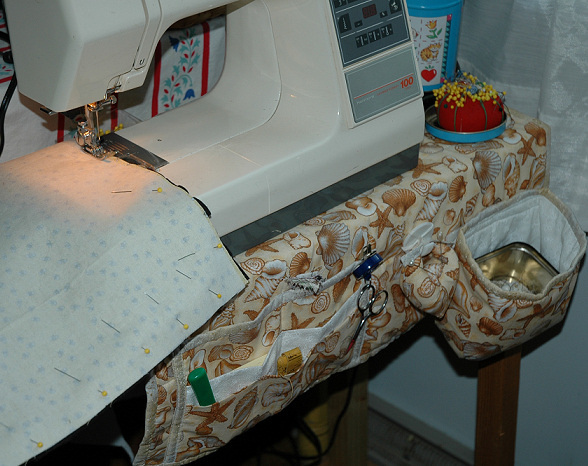 First my sewing machine won't pull the fabric thru as I'm sewing. I'm hoping it's just the feed dogs so I ordered a new one. When I pulled out my back-up machine, which is a really old one I was given when my eldest Aunt died, I found the rubber belt is bad and needs replaced. Instead of doing that I ordered a new Singer at HSN. I've never ordered from them but my brother is a fan so I thought I'd try it. With all the extras it was a better deal than buying elsewhere. I'm glad I have until Jan. to try it. 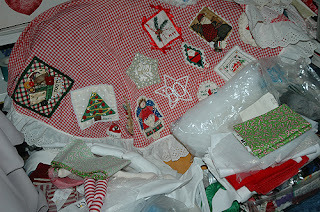 This is a good time of year with sewing so much to give it a real try out. My next problem was my vacuum. The on-off switch went bad. The machine isn't worth fixing with all the other broken bits it has so I'm going to have to look for a replacement. I'm hoping this month isn't one of those where things keep breaking or going wonky. I get so depressed when stuff like this happens so instead of doing my work I play online games. What a waste! I have too much to do and shouldn't waste time. Got these 2 dolls up a few days ago. The goth looking pumpkin girl is Phoebe. 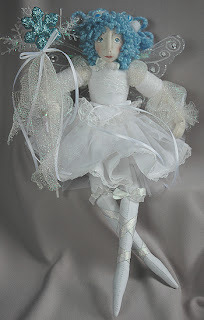 I don't do many dolls with legs but thought it would be a nice change. She has a pet spider,Timmy. I tatted black trim and a long motif to use on her clothing. Below is Yvette. She's a half doll built on a dowel and wood base. She's my favorite for this Halloween season so far. I love the tiny pom-pom trim I found for the edging on the polka dot fabric. I also bought some orange I'm using on another slightly larger pumpkin lady that's partly done. As usual I have a lot of things I'm working on. Here's a photo of the base. I'm really pleased with it. I've had crackle medium for years and seldom used it but now that crackle nail polish is so popular I thought I'd try it again. 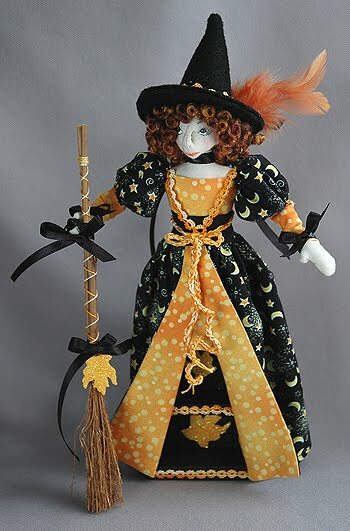 As I list and re-list dolls I'm adding buy it now to many of my ebay listings so customers won't have to wait long or miss getting a doll for Halloween. I'm finishing up 2 small dolls. One is a frog and the other a cat. These aren't my designs. I saw the patterns at etsy and had to get them. I'll post pics and a link to the pattern designer's store when they are finished. I'm also part way done with a large mummy. I wanted a tea stained one this year and I'm using an old pattern I bought back when I used to sell things at a local shop called The Keeping Room. Finally finished this green witch and got her up today at ebay. Her name is Violetta. I had to give her a pretty name when she looked so pretty. I think the purple hair looks great and that's how she got her name. 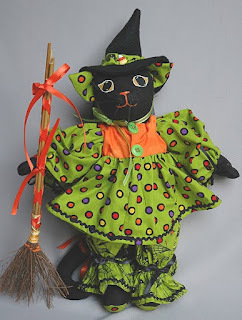 I've made green witches before and have used black yarn and orange yarn for hair. 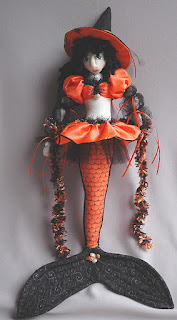 Sold the Halloween mermaid witch today and have had a request for more. I never make duplicates unless the buyer requests it so I'm not sure how I'll dress/decorate the next one. 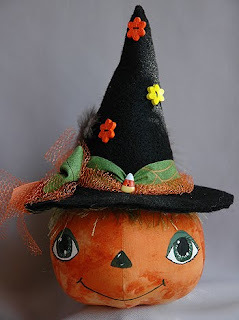 I'm working on a new pumpkin head lady and I'm crazy mad for her. I wasn't sure how I wanted to dress her but last night while I was watching the BBC series 'Being Human' it just sort of came together. 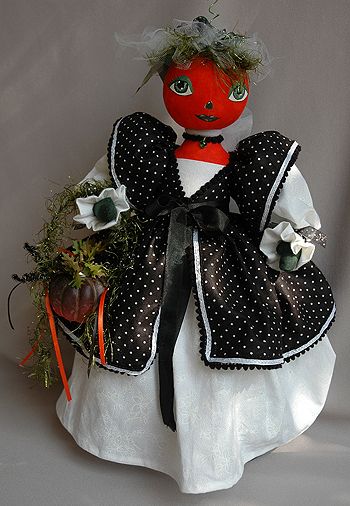 Almost done with a goth white pumpkin girl. She was supposed to be a ghost but I didn't like the nose I drew so she became a pumpkin. I even made her a big spider for a pet! All she needs finished is her shoes. New Halloween Dolls at Ebay! These are the four Halloween items I listed today at ebay. I've made a sold a few stacks of Jacks in previous years and hope customers will like this one, too. This is the first rolie polie pumpkin head I've made. I was stuffing the large head for the stack and when I sat it down it wobbled and reminded me of rolie polies so I thought I'd make one. Here are 2 cats. I love to make cats especially the bat winged one. This is the second in my Sadie cat series and the third cat I've made like this. The first was a ghost cat! Lu-Lu is a half cat built on a wood dowel and base. After adding the netting to her head she reminded me of a Halloween bride or bridesmade. She'd make a great shower decoration! 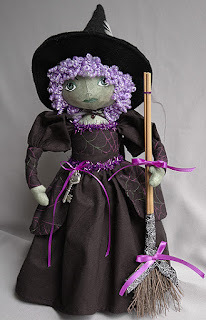 No pics of the green witch I made today, it's way too rainy. DL all the pics I had taken of the newest dolls I finished and found I had taken some of my workroom so I thought I'd post them. The pic above is one of my baskets I carry supplies in so I can sew while watching TV or while outside. The doll is the green witch I wrote about in my last post. I LOVE her purple hair! She's going to be a hard one for me to sell because I already love her so much. I get very attached to many of my dolls and almost don't mind if they don't sell right away so I can enjoy them longer. 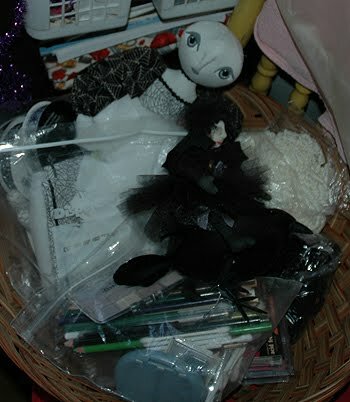 These 2 dolls are in another basket waiting to be finished. This shows how crazy I work. 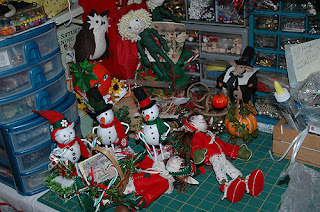 I will cut a lot out, then sew, next I'll stuff them all, and finally they go in baskets to be gathered up when I'm ready to finish them. I have 6 baskets plus a few items just in a pile on the table to finish. I always start too late to make all the things I want to for Halloween but I just can't get myself sewing fall items in the summer heat. Don't forget to watch ebay for my listings! Halloween Mermaid and a Ghost Bride at ebay! For the first time I've made a Halloween witch mermaid. She's meant to hang on a wall or door and would be a great Halloween dec for anyone living near the shore. Look for her at ebay. 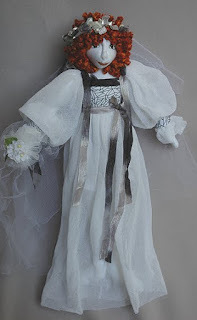 This ghost bride was originally made for a customer who wanted a red haired ghost. She said she loved it but then after emailing her a few times I gave up on getting paid so I'm now offering her at ebay. She's #3 in my ghost bride series. 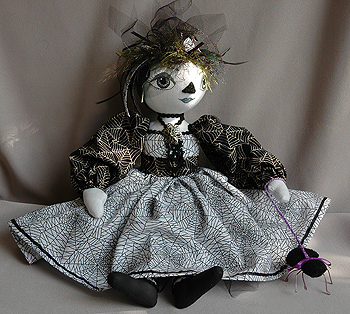 To go with the spider web print I used for the bodice and sleeves, there's a tiny spider in her hair. 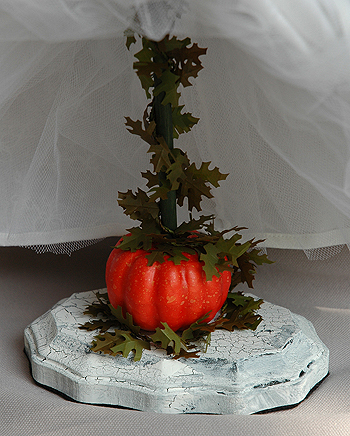 I finished 4 more Halloween things and took pics today. Now I have to DL and resize them, oh and get them up on ebay. 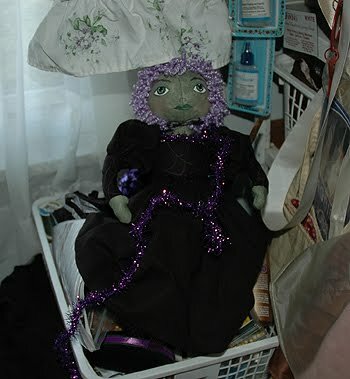 Tonight I plan on finishing a green witch half doll! 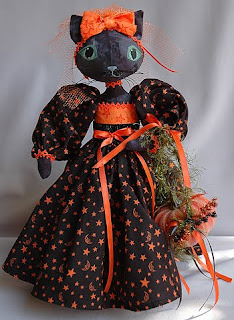 I finally finished this cat I designed using all the latest Halloween fabrics by Moda except for the felt I used for the hat. I call her Trixie Belle. All of the clothing is removeable so it can be washed or even changed. Of course new clothing would have to match the dotted print I used for the soles and inner ears. I like the dots but if you make her you may want to use the same black or another solid basic color. I'll be offering the pattern soon! 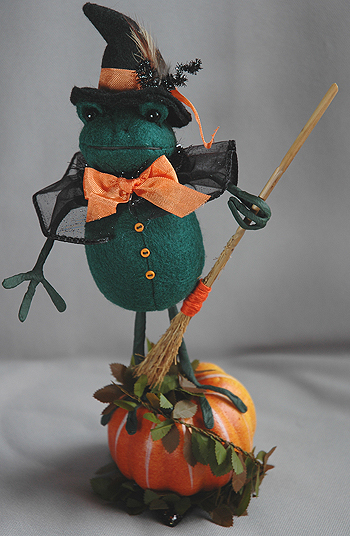 I'm still listing Halloween items at etsy and ebay. Look for tatted skelies at both places. 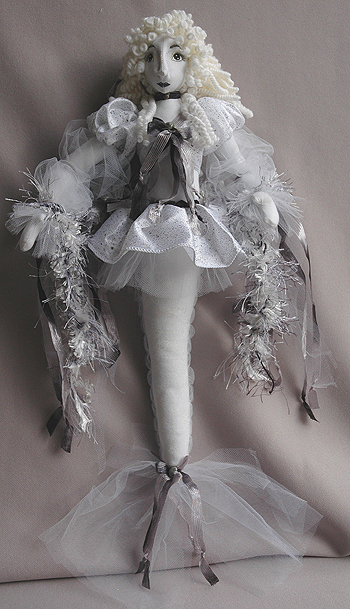 As usual I have many dolls started and in various stages of being worked on. I hope to have a few finished so I can list them this week. 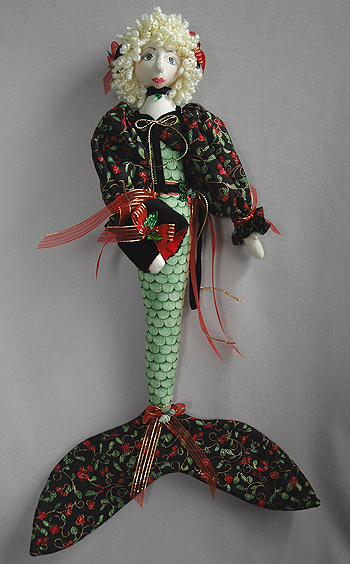 Look for Halloween themed mermaids! 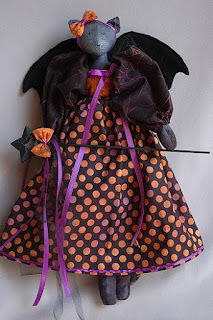 Halloween Dolls up at ebay & etsy! I've started listing Halloween dolls and other items at etsy and ebay. No store at ebay again this year but if you save me as a favorite seller you'll be able to keep track of when I list something. The doll in the picture isn't up yet but will be listed this week at ebay. She's a shelf doll. That means under her skirt is a small shelf that's perfect for holding any tiny Halloween collectable you have. I've seen some cute tiny potion bottles and tarot cards that would be great for the shelves on sale at etsy and ebay. You could also display small pieces of jewelry on the shelves, too. I'll also be listing some fobs and tatting, too. Got a Whipup link about my Fabric Basket! Click the graphic to go to Whipup for the best craft links! I'm so excited. I submitted a link for the free fabric basket I designed to Whipup and got accepted! Mine is the first link in the list! I've had a link to their site here at my blog since I first found it. They list so many great free projects and contests. I also keep their link on 'my yahoo' homepage so I know what's new there. 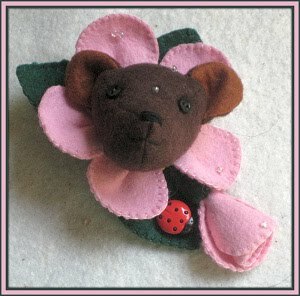 I made this cute flower bear pin/ornie using felt I got at http://www.comonwealthfelt.com/. It's National Nonwoven felt, made in the USA, and I love it! You can get this pattern for free at http://patternmart.com/nlarchive/20110801/ . Click on the August 2011 Monday 1st link and fill out the survey. Patternmart sells my patterns and I write articles for their online magazine called Creative Times. Just a quick post to let you know that my Artfire store will be closing August 16, 2011. The owners have decided to charge a monthly fee of $9.95. I just don't sell enough there to pay that. It's not that well known of a site to charge that high of a fee. I would have been willing to pay what I do at etsy. That would make much more sense for a newer site without many customers. 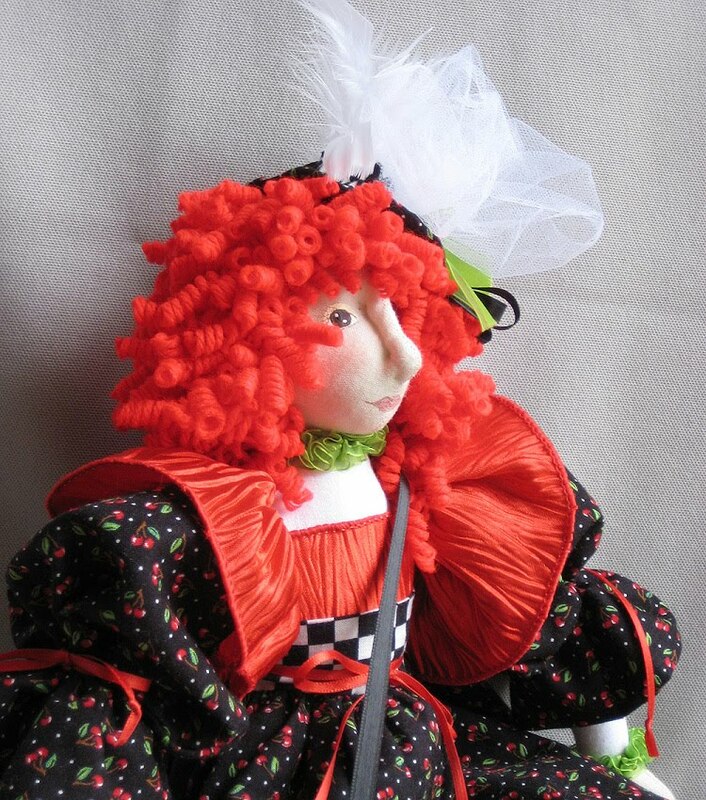 I'm still at Etsy, Patternmart, Patternspot, Doll Maker's Journey, Cloth Doll Patterns, and soon I'll be listing Halloween dolls at ebay. Web site update and a friend is having a free give away! 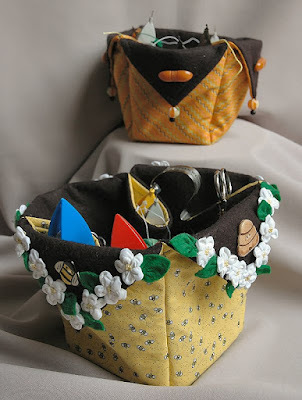 In case you missed my last post I designed these fabric baskets as a free PDF file! You can get the pattern by going to my previous post or going to either of my http://www.heislerscreativestitchery.com/ sites. My previous post will take you to http://www.4shared.com/ to get the file but I uploaded the file to both of my web sites so you may prefer to go there. Go to my previous post to see the outside of the baskets. This pic shows how I filled them with shuttles and thread. Love these baskets! Right now I have one filled with crochet cotton I'm using to make a tote I came across at a site called craftsy. I saw a pic and knew I could duplicate it easily. A blog I follow is having a give away. If you LOVE Halloween you have to go to her blog. Don't forget to check out the sites where she sells her creations, too! 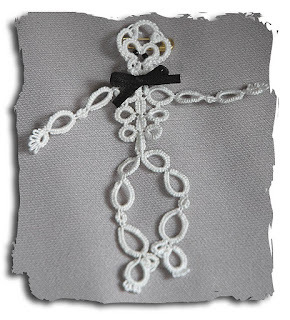 Free PDF Pattern for Tatting Basket! 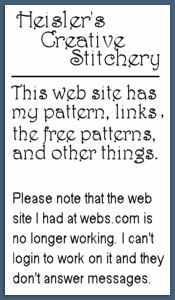 The link will take you to a folder I set up for free patterns. Right now this one is the only one there. Click on the pattern picture and it will take you to a page where you can download just that pattern. 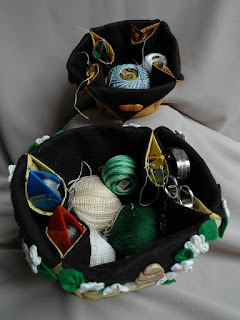 Make a cloth basket to hold your tatting supplies. The large size is great if you use large shuttles like the ones by Tatsy while the smaller one is perfect for smaller shuttles. The pattern is full of color photos to make it easy to follow the directions. Right now this is the only place you can get this pattern. I'll be listing it on my web sites later this week. After I tidied up my sewing room and decided I didn't want my machine on the same table I use for cutting or on my old treadle machine I decided to use this narrow table I put together ages ago. Problem was there were no drawers so I knew I needed some sort of mat with pockets. At the time I was feeling more than a little burnt out designing so I had a look at pdf patterns at etsy and came across this shop http://www.etsy.com/shop/aSundayGirl . The picture above is the one I made using her pattern. I left off the felt flowers (I plan on adding seashells) and made a different pincushion that I hung from a hook I sewed to the mat. I had a tin that was the same size as the scrap bin so I put it in the bottom. Makes it so much easier to empty when threads and fabric aren't stuck to the inside of the bin. The really great thing about finding this pattern is that it's fired me up again to design so I 'm finishing up 2 pdf patterns. One will be free! I'll list it here at and on my web site. I have a lot of ideas for free patterns I plan on doing but don't forget to check the link to my web site where I have some free patterns. They aren't pdf so you'll have to print them off the web if you want them. Here's the link that will take you to whatever is the current issue when you click on it. Check out the Archives, too. Finally Lisette is up for sale! I finally made the time to put up my latest pattern Lisette, the gift bag doll for sale at all my sites. 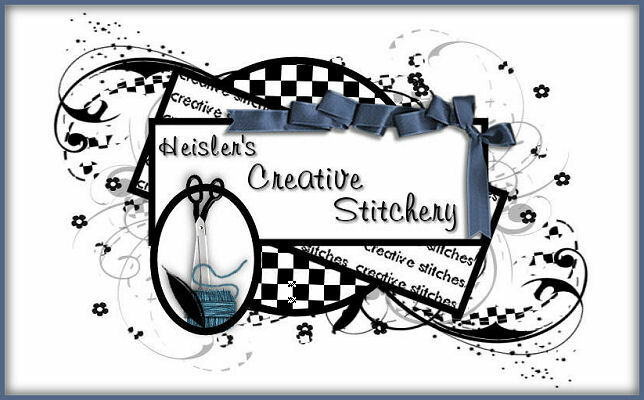 You'll find her at both mirror sites at http://www.heislerscreativestitchery.com . She's also up at Patternmart, etsy, and artfire. The pattern is $8 and as with all my patterns it comes printed book style with a photograph on the cover and in a zip top plastic bag. I'm not sure if I'll do her as a pdf but will post about here if I do. Speaking of PDFs I've been getting requests for the tatting patterns done that way so overseas buyers can get them. I don't ever plan on offering them as PDF files and wish to say I'm sorry too but I don't ship overseas. You could always request my patterns be carried at a shop you know ships to your country. Maybe they would consider carrying them. Free Patterns at my web site! 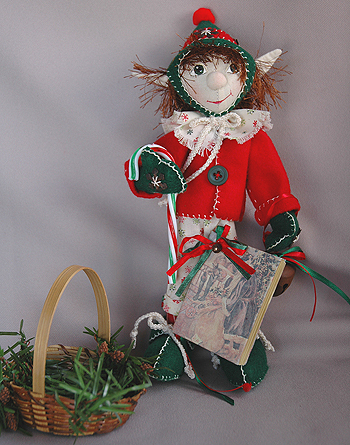 Did you know that I have free patterns at my web site? 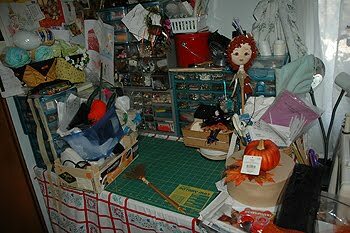 Most are tatting patterns but there is a sachet doll pin, a mini clothespin horse and an angel bell ornament for those who don't tat. 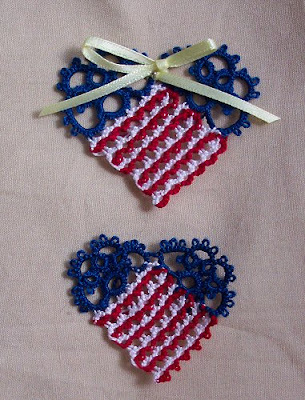 Here's a pic and link to the red, white, and blue tatted heart pin. Very appropriate for today! I have 2 sites set up so if you can't get to one you should be able to get to the other. Finally finished my new doll pattern and have the cover photos. It will be listed later this week at etsy and artfire. I started Lisette the same time as my witch pattern, Lena. Originally I had planned on a pattern with both dolls but that changed as Lena took on her own life and became a witch with a frog. I posted some news on my web sites about the Aero shuttle and thought I should add it here, too. I have had some complaints about the shuttles and have noticed just how soft the plastic is they are using for the shuttles and bobbins. I found the newest ones are being made in Mexico. My wholesaler suggested I try a shuttle very similar to the Aero called the Pony shuttle. I bought 2 so I can try them before I offer them for sale. If I like them I'll order more to sell at etsy and artfire. I also got in some Sew Mate shuttles. They are a larger version of Clover shutlles. They seem really nice so if you prefer a shuttle with a pick on the end you may want to try these. They will be listed by the end of the first week in May. Still need to get my computer in for a few more fixes so if you contact me and don't hear back by the next day you'll know it's in the shop. Been a while- New pattern! I finally finished my bag doll pattern! This is Lisette and she will be for sale when I get her cover photo shot. 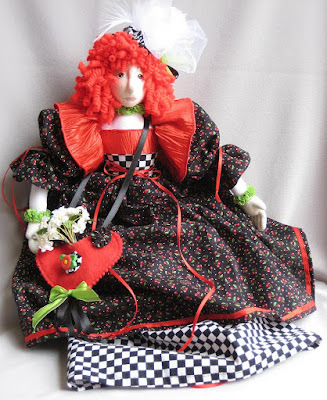 I really like this kind of doll because you can put a gift in the bag skirt and you end up giving 2 gifts. I used fabric designed by Mary Englebret. I bought quite a bit before the local Walmart shut down their fabric department. I still really miss it. It's just not the same having to order fabric online. There are 2 small quilt ships locally but I don't always want to pay their prices so I end up buying at etsy, ebay, and joanns online. I'm working on rabbits to sell at ebay and will have them up after the 19th. Hope you'll go have a look, ebay id: creativestitches.